1. The Green fruit is quite poisonous so try not to consume this fruit unless it has ripened. 2. It is bright red in color when ripened so you'll know when it is edible. 3. If you want to plant the seeds remember that the pods are not the seeds, the seeds are inside and there are usually about 4-6 seeds inside. It's taste is quite similar to the strawberry and it is quite nutritious. 4. Some species have fruity flavours with overtones of strawberry or apple. 5. They are said to be rich in Vitamin C, calcium, magnesium and phosphorus. 6. The fruit is also used to make jelly. 7. Various birds eat Carissa fruit and distribute the seed. 8. If eaten before fully ripe, a bitter, poisonous latex is released from the skin. Other than the ripe fruit, the plant is poisonous. 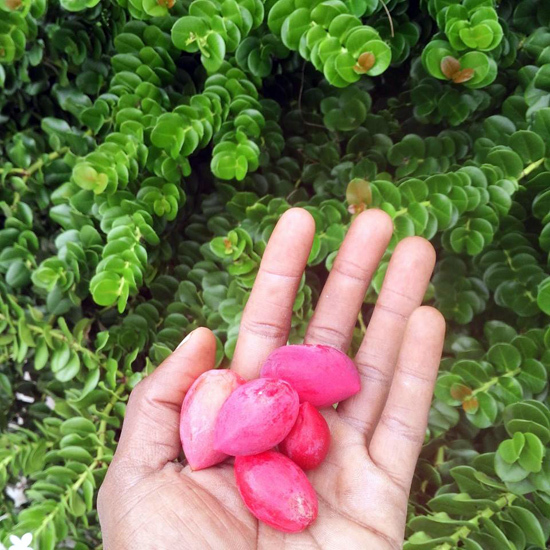 We ate this fruit a lot as kids here on the island, and old folks knew of it and its poisonous qualities. Sadly not many people speak of the Carrissa anymore. It is also used for medicinal purposes. I have seen this plant growing at my friend Keith's place and I've seen it at The Ol' Freetown Farm as well. They have quite a big tree on their farm which I enjoyed thoroughly the last time I was there. It's an excellent fruit to enjoy, and I hope I've helped educate a few people that didn't know of this beautiful shrub and fruit.